Just to get me well and truly in the mood for cooking school, I went back to Le Cordon Bleu for the third day in a row having spent two days there at the food blogger’s conference. As part of Wellington on a Plate, I had enrolled for a short course, An Introduction to Patisserie by Chef de Patisserie Sebastien Lambert. 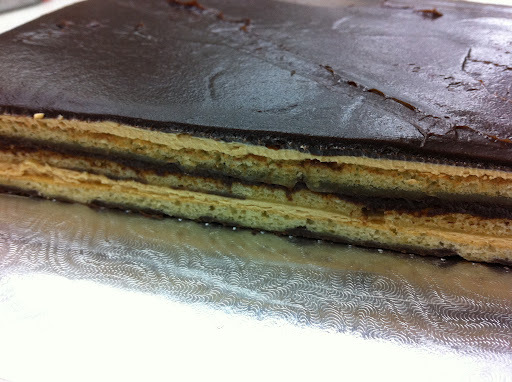 How ambitious to get a classroom of amateur cooks to make Opera Cake in four hours. It’s layer upon layer of sponge, chocolate ganache and coffee buttercream! Or according to Larousse Gastronomique, Opéra gateau is an elaborate almond sponge cake with a coffee and chocolate filling and icing. Anything that requires chocolate ganache, chocolate glaze, coffee syrup, coffee extract, sugar syrup, glucose, a thermometer, and the manhandling of a huge sheet of sponge is usually well beyond your usual half-day cooking school. But thanks to his expert tuition, we all managed to produce a beautifully-trimmed square of rich creamy cake. As we finish trimming the cake, Sebastien exclaims, “you can use the off cuts to roll into truffles” . I looked down at my pristine work bench. Not an off cut in sight! After an hour-long demonstration in the kitchen lecture theatre we moved to LCB Patisserie kitchen. 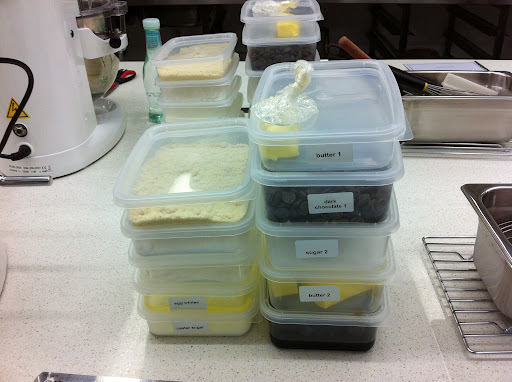 Marble benches, brand new shiny pots and pans, spatulas, pasty brushes, oven trays, and as you can see, all the ingredients neatly packaged and ready for use. The industrial style food mixer took a bit of getting used to but Sebastien buzzed around the room providing help where needed. Getting the sponge cake spread out evenly on the large tray and safely in the oven was the first challenge. I’m talking about a tray that’s three times the size of a lamington tin. 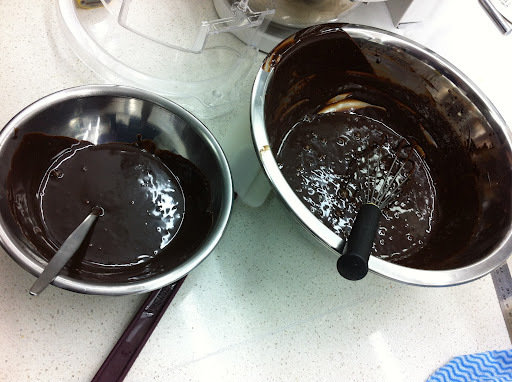 Then we made the ganache, removing a quarter of the mixture for the glaze, before adding the butter. Yes, that stumped a few of us. The glucose went in this lot to make a shiny topping for the Cake. The coffee buttercream was like a science experiment. Eggs and yolks to ribbon stage, boil caster sugar and water to 118 degrees (no, not 120) then drizzle from a height into the eggs sabayon but don’t add the butter until the bowl has cooled down. Then add the coffee extract. With all the elements completed it was time to compile by cutting the sponge into three, and gently painting with coffee extract then layering coffee cream and ganache between the layers of sponge. Voila! Wow, I feel exhausted reading this. So much achieved in so little time. You are going to rock this LCB thing.